The Dassault Rafale is “tremendously capable in all its role. It is a multi­role aircraft and can be used very effectively. It can prove its worth in any situation,” Raha said. “But we have just ordered 36 aircraft and we require more aircraft in this middle weight category to give entire spectrum of capability,” he added. The IAF currently fields 33 fighter squadrons. That number is supposed to increase to 42 by 2027. The number of squadrons is based on a hypothetical joint threat from China and Pakistan. The IAF will need at least six additional squadrons of medium multi-role combat aircraft. This increase in squadron numbers can only partially be accomplished by increasing the serviceability rate of combat aircraft currently in service. New acquisitions will be necessary. 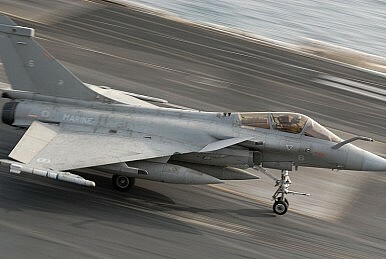 U.S. defense contractors Boeing and Lockheed Martin [next to other aircraft makers], along with their F-16 and F-18 aircraft, were outbid in 2011 under the now-scrapped $20 billion MMRCA (medium multi-role combat aircraft) project by French aircraft maker Dassault Aviation, with India opting for Dassault Aviation’s Rafale fighter instead in January 2012. However, the MMRCA project was cancelled after years of difficult negotiations in July 2015. India has already received proposals from Lockheed Martin, Boeing, and Saab to build the Lockheed Martin F-16 Block 70, Boeing F/A-18 Super Hornet, and Saab Gripen E fighter jet locally in India. It is unclear when the Indian government will make its final selection. The Indian Ministry of Defense has issued a Request for Information (RFI) to global aircraft manufacturers.